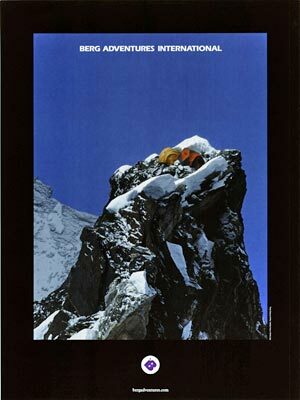 If you have ever been trekking in the Everest region of Nepal, you will recognize these posters. Taken by Wally Berg on past expeditions in Nepal, these images have been admired by thousands of trekkers on the walls of our favorite lodges and stores throughout the Khumbu. Last spring while in Nepal, I heard countless people marveling at the seemingly precarious campsite on Ama Dablam and aweing at those brave enough to scale Everest’s summit ridge. We have the posters in our office and rarely does someone leave without asking about where they were taken and what it is like to be there. Now the Berg Adventures posters are available for purchase. Hang them in your exercise room or workshop for inspiration, or put them in a frame and hang them in your office as a conversation starter. They make the perfect gift for those with Everest aspirations or for those who simply love the mountains and admire the strength of the human spirit. 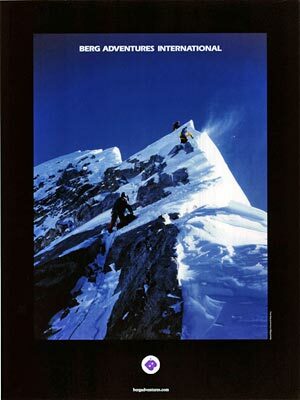 Contact Sara@bergadventures.com or give us a call to order your poster. Available for $25.00 including sales tax. Shipping not included. Check out our BAI Store for books and maps.